With NorthGate Commerce District and the Shoppes at NorthGate about to take off in Sunbury, Planet Oasis under discussion in Berkshire Township, and the Simon-Tanger Outlet Mall already open for business in Berkshire, a host of residential and commercial developers are going to come forward asking eastern Delaware County zoning commissions to approve individual projects. In that vein, Northgate Construction Services principal Pat Shivley attended the Monday (August 27) Village of Sunbury Planning & Zoning Commission meeting for a zoning application public hearing to change 46.67 vacant South Galena Road agricultural acres to Planned Residential District (PRD). The zoning change application, if approved, would allow a new 127-unit single-family residential development on the site located immediately south of the Estates at Cheshire, with a primary access off of South Galena Road. 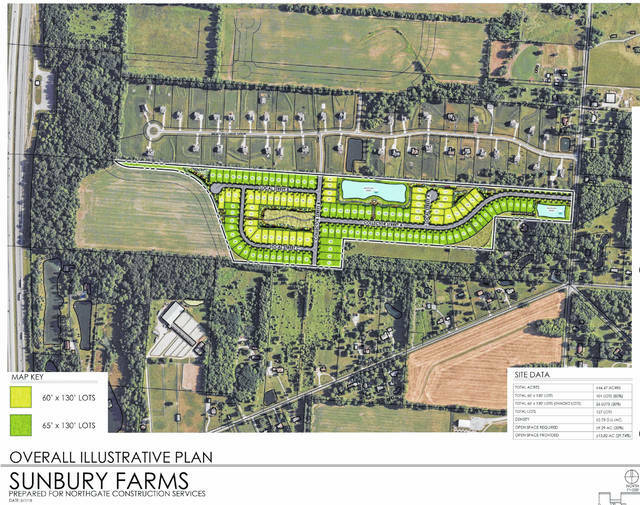 Todd Faris of Faris Planning & Design LLC, a Columbus-based Land Planning and Landscape Architecture firm, accompanied Shivley, along with Matt Callahan, representing the proposed Sunbury Farms homebuilder Pulte Homes. Callahan said the Pulte Homes models slated for Sunbury Farms, while different that Pulte’s Sunbury Meadows line, would feature 2,000 to 3,200 square foot houses in the low-to mid-$300,000 range. Faris said the proposed residential development would feature 60-foot and 65-foot wide lots, and east/west central roadway system, code compliant green space with a trail system, and be serviced by a county sewer system. In mid-April Delaware County Commissioners approved a key component allowing development in that area to move forward at an accelerated pace, an intergovernmental agreement between the county and Sunbury formalizing sanitary sewer service areas that would be covered by each entity. That agreement stipulates that Delaware County would provide sanitary sewer and wastewater treatment services within the NorthGate development area west of S. Galena Road; Sunbury would provide sewer services east of S. Galena Rd. Faris, during the public hearing portion of the evening’s agenda, talked commission members through a preliminary site layout. Faris said the proposed PRD would adhere to current Sunbury code, with the exception of five requested divergences: front yard setback reductions to allow a common front setback distance from the road and larger rear yards, a rear yard setback reduction to allow decks, side yard setback reductions, increased home lot coverage, and lot line adjustments to allow for cul-de-sac radial lot lines. Faris said the traffic study should be complete within the next 30 days; all dead ash trees in the developer’s portion of the tree line between Sunbury Farms and the Estates at Cheshire would be removed; and the development features 30 percent open space, code calls for 20 percent. Dave Parkinson, CT Consultants, the village engineering firm, cautioned that problems could arise if homes were built prior to a sanitary sewer system in place and operational to service the development. There was a recommendation to reduce the internal roadway easement width, allowing the applicant to adjust the design before returning to zoning within the statutory 60 days for a final vote to either approve the Sunbury Farms development or deny the zoning change application. Members of the Village of Sunbury Planning & Zoning Commission meet at 7 p.m. on the forth Monday of each month. The next Sunbury zoning meeting will be held on Monday, September 24. Information for this story was provided by Northgate Construction Services.